Global market analyst DNV GL peeled back the layers of its recent forecast on global energy source evolution to reveal that solar & wind energy, buoyed by offshore wind, will grow to represent nearly 70% of global electricity production by 2050, according to Richard Barnes, the Executive Vice President and Regional Manager for the Energy Business Area of the company in North America. “By 2050, renewables will represent 70 percent of total electricity use in the world, versus 20 percent now,” Barnes and a sizable DNV team predict. 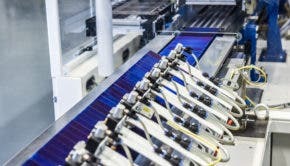 The details of the report, launched earlier this month (see CleanTechnica’s report from September 13) took place during a closed presentation at the Solar Power International conference being held in Anaheim this week. DNV’s “Energy Transition Outlook 2018” is the second in its annual long-term outlook series, and is a tool that should not be refocused to foretell the short-term future, since it does not consider politics. However, the study can be used to interpret mid-term energy source evolution, according to Barnes. “All the disruption we are seeing in renewable energy, including energy storage, is being driven by declining costs. It’s sort of like the cost implosion in LED lighting: 10 years ago an LED bulb cost $20, now one costs $2,” says Barnes. In the case of solar PV, DNV expects that an 18% drop in current installed cost will result in a doubling of today’s installed base. While DNV’s prediction that energy demand on a global basis would peak and then begin to decline around 2035 may be somewhat controversial, the reason for the decline after that date is primarily increased energy efficiency, points out Barnes. “Energy efficiency, especially in buildings, in some manufacturing, in utility programs promoting behavior, and in transportation, will all contribute to the future decline of energy use,” Barnes says. These gains will arise in part because more electricity will be used in these industries in place of oil, since electricity is easily monitored and controlled by telecommunications, he suggests. “Electricity today accounts for about 20 percent of all energy use and by 2050 it will account for 45 percent,” he reckons. Building use of energy efficiency technology will revolve around low-temperature space and water heating, DNV suggests. “Residential and commercial buildings are ripe for electrification given recent advances in commercialized technologies, particularly heat pumps,” the report indicates. Industrial energy efficiency will involve more diverse technologies, given that the sector uses energy low- and high-temperature process heat, spacing heating, drying and separation functions, DNV says. The electrification of the transportation industry may represent the biggest change that is expected in energy use over the next few decades. Transportation industry demand for energy, mostly fossil-fuel based, is expected to increase to a plateau of about 120 exajoules per year in the decade between 2020 and 2030. Thereafter, transportation energy use is predicted by DNV to drop to 100 exajoules per year, as electric fleets harness energy efficiency measures. An exajoule, or EJ, is equal to one quintillion (10 to the 18th power) joules. Yearly U.S. energy consumption amounts to roughly 94 EJ, according to Wikipedia. The triumvirate of renewable energy — solar PV, wind, and energy storage — will receive a cumulative capital expenditure of five times the current level, Barnes predicts. Not surprisingly, by 2035, renewable energy capex will exceed that of fossil fuels, he adds. Such progress in the development of renewable energy will require new market mechanisms to change the way that energy storage is valued by utilities and public utility commissions, to change the current practice of utility investment recovery of stranded assets, to change the way intermittent users of the grid pay for their access, and mechanisms to value the use of ancillary renewables generation by the utilities, Barnes says.